at the world's largest crop attempt next friday night at the cha craft supershow, i will be conducting this adorable make & take project. it's a block pendant made with ready-to-go blank board blocks. the crop is a fundraiser, and people who want to do the make & takes donate just a few dollars to the charity. i'll have 200 blocks at only $3 each, so i'm hoping to raise $600! we'll be playing with a bunch of different adhesives from beacon for fabric, paper and laminating. we'll be painting, doodling, beading and stamping too! i'll have loads of supplies so that everyone will get to create their own pendant design. so if you're going to the supershow next week - i hope you'll join me at the crop! last month i painted this windy ocean atc on grunge board. i finally decided what to do with it this month, when I was about to toss out the top sheet of paper in my desk blotter pad that was covered with paint streaks from various projects. in this piece of painted scrap paper, i suddenly saw the perfect backdrop for this atc. i cropped the best 4x6 section and inked the edges. i placed a smaller piece of yellow handmade japanese tissue paper on top. then i painted and burned a piece of lutradur, inked the curled edges with a gold leafing pen, and layered that under the atc. i found a really deep white shadow box frame on sale, placed a few seashells inside, and voila! this past weekend i took another altered book class from daniela costa. she is totally into the series of twilight books and the movie...for this class, she gave us all a hardbound copy of the first book, along with a huge bag full of papers and embellies. i went off in my own direction, as i am wont to do. but this is why i love daniela, she is very encouraging and just wants us all to be in our happy place, creating. we all had to read the book so we could chat about it, and the movie was playing in the background while we worked. now to be honest, i was not nearly as into the book as my fellow classmates and teacher. but once i glued all my pages together and carved my round niche, i decided to put myself in the shoes of the heroine, who fell in love with a vampire. i tried to think of all the reasons i might find a vampire appealing, then express those things creatively on the page. i thought of dark romance, gothic beauty, power, wanderlust, mystery, freedom, riches, graceful elegance, and the bliss of complete surrender. oh yeah, and then there's the abject fear...and um, the interesting way they, uh, commune with nature. i used liquitex gloss heavy gel medium to glue all the pages together, and distress crackle paint on the edges, love that stuff. now to put away the bloody mess on my craft table...mwaaaaahhh! my atc club starts in august! 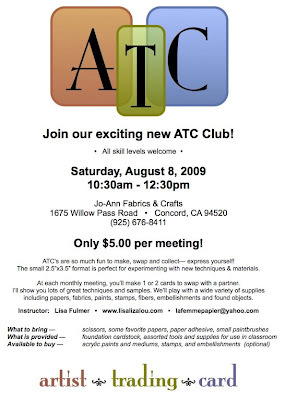 if you are in the bay area (northern california), i hope you'll come to the first meeting of my new monthly atc club! atc's are lots of fun to make, swap and collect. you can rsvp on facebook or email me here to sign up. click the flyer here to read the details up close. i made a quick book of some of the atc's i have collected from other artists and crafters. i used a 10x10 blank board book, kept it simple with solid cardstock backgrounds inside. the cover is cut from a poster of asian pots by artist lisa ven vertloh. i added a geisha atc made by one of my friends on flickr, sabrina from italy. once when i was flipping through old magazines in my doctor's office, i came across this photograph that richard avedon had shot of barbra streisand. i liked the shapes her body makes in each pose, so i made a rough sketch on some scratch paper and tucked it away in a file. today i found the sketch and decided to paint it...here is my interpretation of this photo in acrylic, 6"x6". congrats to these two, be sure to check out their blogs. thanks to everyone who follows my blog, either through google or facebook. now as for all you email subscribers....i'll have a prize drawing for y'all next week! well, i hope it's like riding a bike...i have not made any art or done any crafting in a few weeks while we were moving into a new house. so i started with a couple atc's, just to warm up! i had made a 12x12 romance-themed collage a few months ago that i wasn't thrilled with, so i decided to chop it up and recycle parts of it. both of these atcs are on timtex. for the one on the left, i layered papers with acrylic paint, mod podge, crackle medium, and glass beads texture gel. i burned the edges of the other card, then layered painted papers and transparency with lesley riley's tree printed on lutradur (stitched by one of my twisted thimble pals). feels great to be back! !